Local Radio: Who Do You Know? 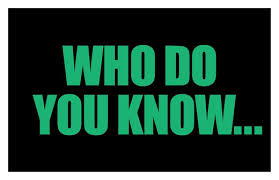 Who do you know? A lot of personalities on the radio and owners/operators of radio stations think they don’t really need to meet new people, but it’s not true. Today’s media world and listener attention is splattered all across your market and you have new competition every single day. Living otherwise is crazy. So, how can you use social media to put your radio station and personalities smack in the middle of the local conversation? Let’s take a look. 1. Check out Twitter and find out what is trending. Look at the people in your market who are having an influence. Get in their conversation. Yep, you might be larger, but you know how this works. Influence someone who is really influential and you may find that your own influence grows over others. Are you ready for that? It takes work, but a little bit every day can make your local brand and personalities much more engaging and in the conversation. 2. Look at the local groups and pages on Facebook and connect. But don’t just connect. Get engaged in what these groups and individuals are interested in. If you do this, you will be amazed how you will pick up more “followers” (listeners) and grow your brand influence. 3. Take time to really look at the hyper-local causes in your market. Say it doesn’t matter if you like, but local charities are the path to higher local engagement, higher listener involvement, more passion…and money (revenue). You should be involved in each of these and social media is a powerful way to connect, engage, and share passion and the passion of others. Because of your existing influence, your engagement at this level means even more. It means more to those involved and the power players behind the scenes. 4. Engage individual listeners on their own Facebook pages. No, I am not kidding. People love to be validated and that is the point in 2014. So many people are so busy, and people – believe this or not – have socially pulled back while social media is often the biggest engagement they have with others. Meet them at that party by liking their photos and comments. You’ll be surprised at the results. This works for radio brands and especially personalities. Are you ready for that kind of wave of engagement? You should know how it works: The more you give, the more you get! 5. Read “How To Win Friends & Influence People” as if it was written about Facebook, Twitter, Instagram and radio. That’s right. It was written a long time ago, but only technology has changed. Look at your social media like you would look at radio…or a party…or just doing a meet-and-greet. This is the stuff that works and you can do it. Bonus: Be visual, be consistent, and work to have eye-catching headlines, visuals that get attention, and make your content oriented to helping others in your market, and you will be shocked how much people engage you and even share your content with others. You work in a business that should certainly be people-oriented. Everything is smaller than you think it is. Don’t believe it? Try it on yourself. Do these five things and see if where you are right now is closer than you think to big, big engagement on Facebook, Twitter, other social media, and your own radio station. You can do it and you can encourage personalities, salespeople, and everyone else in your building to turn on the value of social media to make you more listeners, more community involvement, more influence, and – yes – more revenue. Try it for 45 days and be consistent and then let me know what your influence boost was from doing just these five things by emailing me at Ford@RainmakerPathway.com. You can be as successful in social media as you want to be if you develop a specific social media content strategy, commit to consistency, and have fun! Enjoy! Go to http://www.Facebook.com/socialnetworking4radio and then click “LIKE” to begin receiving free social media/Facebook content on radio and social media. Go to the right-hand top of http://www.rainmakerpathway.wordpress.com to sign up to get this actual social media – radio content sent directly to your smart phone or email about once a week. Check out past content @ http://www.rainmakerpathway.com and take time to enjoy your life. It’s just radio. I love it, but a job will never love you back. Invest in people. ← What Are The Next Moves For Your Local Radio Brand To Deepen Your Roots With Social Media?